I think this year is going to be another year of focusing on UFOs or PhDs or WIPs — whatever your preferred terminology is. It has been my off and on goal to finish so many before starting new projects and I’m fairly good at doing that now. So! I wrote down 13 projects that I want to finish in the upcoming year. Some of them I’m excited to be working on, others I’ve put off for years for various reasons (looking at you evil #6!!!). I’m not going to restrict myself on new projects, so long as I keep working on the old ones. I would, however, like to see how much I can work out of my stash this year. …which may prove impossible since I’m the MOH in an April wedding and things are getting a bit nuts and I just got the stuff to learn to play with vinyl so I can save myself a bunch of money through sweat equity. We’ll see how that goes! I had to ask for a photo of the Tunisian crochet blanket I finished last month. In my delight to have it done, I shipped it out without taking a single photo of it past the panel strips stage. I put a super soft, plush fleece on the back to make it extra snuggly and warm. …and to start the new year off with a question/survey thing! •What is something I say a lot? “Rub feets?” or “You should be doing your chores.” Is it sad that I’ve driven you to say that so much? When I don’t follow through with what I say I’m going to do. •What’s my favorite thing to do? You used to be 5’10” but now I’m wonder if you’re not 6′ because often times it feels like you’re the same height or taller than me…unless I’m varying like crazy. Probably your incredible wisdom for someone your age. •What do I do when you’re not around? Only when I’m not around? I think you’re mostly doing crafting when I’m not around but you also do that when I’m around. Talking to people on the interwebs? •What’s my favorite TV show? Man, that’s hard. Peaky Blinders? I don’t know if that’s your favorite though. Maybe it’s Fraggle Rock. I can’t imagine you liking Fraggle Rock as much as Peaky Blinders these days. Is it’s Sherlock? I think it’s Sherlock. •If I became famous what would it be for? I think right now it’d be for crafting I would say. That’s the number one thing you do that has public outreach. •Where can I most likely be found? • What is my favorite restaurant? It’s definitely a Brazilian steakhouse. It used to be Fogo de Chão. •Where is one place I don’t like to be? In the presence of my dad. Maybe I should change that. Is this publicly accessible? •If I could go anywhere where would it be? You’d probably like to go see Antarctica. •How do you annoy me? -laughs- By having difficulty listening. I think that works for a lot of them. •What’s my favorite kind of pop? •What is my favorite kind of food? •You get a call that I am in trouble, who am I with? Since I’m finally done posting about the adventures in Scotland and the Irelands, I can return to mundane life again! …which has been anything but boring lately. The dogs caught a baby bunny last night and injured it. It escaped by the time Logan pulled the big dog off and alerted me, so I can only hope its okay. The wax seal on the toilet in Logan’s bathroom sprung a leak…and that is the bathroom we haven’t remodeled yet, so it was still carpeted. …meaning the already gross carpet was now soaked with dirty toilet water. It had to come up. The cutoff valve for the toilet was also broke, so I replaced that and exchanged the flushing mechanism with a duo flush low flow variety while the toilet was off the drain. After the dirty work, I made a stuffy for Logan’s niece to be. He wanted me to make her a penguin for Christmas. He chose the colors and pattern. I’m still not a fan of this designer. Her patterns are adorable but the execution is poor. I had to alter a few pieces, add seam allowances even though she says they’re included, and completely change construction at some points. I wish I had tossed the instructions altogether, then I would have ended with stuffing via a ladder stitch up the back instead of cursing while trying to sew a stuffed head to a stuffed torso and leaving it a weaker joint. I may remake this one later if I care enough. I also got in a bit of stitching. This whole project has been slow as molasses. Finally, I decided to make Grandmother a facecloth to go with the Scottish soap I brought her. It’s a bit of a joke, really, as we didn’t see a single washcloth the entire trip. It was really frustrating, actually. I started it in a variegated blue yesterday but the pattern wasn’t showing well enough for my tastes, so switched to a pretty, solid mint. I just have two more repeats and the crocheted edge to finish. It’s nice having a quick project for a change! 2,000 stitches down (give or take), I don’t know how many hundreds of thousands left to go at this point. I’ve already forgotten. Actually, I don’t care to think about how many I have left at this point. I’d probably cry. At least I think it’s pretty and I still like working on it. I just wish I had a longer attention span so I could get more done each day. The only goal I have for it at this point is to finish the first page (that’s right, just the first page out of 40 something pages) by the end of the year. I don’t have a lot of time to dedicate to it, so we’ll see how that goes. More mail, a minder, and the mehs. I got a card from my in-laws. Logan reminded them it was my birthday coming up, so they sent me a card and check. I also got a sweet card from my Grandmother and a bit of money. Her cards are always thoughtful and worth more to me than any money she sends. I’ve already decided to put her money to good use and buy two reblooming pink lilacs (lilacs are my favorite flower) and a black currant bush to expand our new berry garden. I’m also a big fan of spending money on memories instead of stuff, so I think I’ll use the in-law’s check to buy tickets to see two shows at our local “Broadway” theatre. “Evil Dead the Musical” is coming near Halloween and “Colin Mochrie & Brad Sherwood: Scared Scriptless” have a date set here as well in the distant future. I love them from their Whose Line days and Logan is a big fan of improv, so it seems like it would be a fun night for both of us. Things to look forward to are always nice. There was also a small package from another member of the Cross Stitchers Unite group! I didn’t have a needle minder yet (I never found a magnet that would work with the covered button one I tried to make), so I’m really quite excited to have such a cute one to try out….and who doesn’t love shiny floss?! I think Logan felt a bit left out from the birthday giving because he also received a package in the mail that turned out to be a gift for me and decided to go ahead and give it to me. 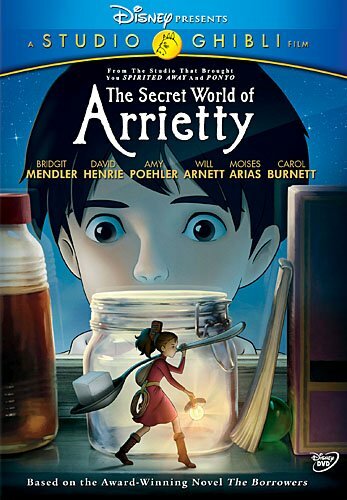 It was a DVD of Arrietty. I looooved The Borrowers when I was a kid! I also adore Studio Ghibli films and have been trying to collect them all for endless hours of mood boosting fun. Logan hasn’t seen this one yet, so we’ll have to add it to the list of movies to watch after we finish the extended editions of the Hobbit trilogy (much better the theatrical releases, in my opinion). I’ve been in a really bad funk the past few days — it tends to happen this time of year — and all the little surprises in the mail have helped so much. This weekend, my signed copy *squeeeeee* of Ayreon’s newest project “The Source” showed up. I ended up forking it over to Logan. I felt he needed it more than I did. While Logan was mowing on Saturday, he ended up getting poison ivy -he’s highly allergic- on his face near his eye. Thankfully, I went to gloat about the CD’s arrival and noticed the rash and we were able to stop it before spread INTO his eye. Not only did he end up with poison ivy on his face, but he also ended up with a nasty case of skeeter syndrome…which I’ve never seen on an adult before. He also said he’s never had it. Mosquitoes love Logan. He’s like the tastiest of tasty to those little blood suckers. He made the mistake of using my Off instead of his, not realizing what a difference it would make. I’ve never been bitten by a mosquito, ever. They just buzz in my ears and near my eyes, so I use a really low level repellent to keep them from annoying me. Mine has 7% DEET and only lasts for about 2 hours of doing nothing…the stuff he normally uses is 98.5% DEET and lasts for about 10 and through sweaty work, and he still usually gets bitten. He was eaten alive on Saturday….and is covered in regular mosquito bites and what looks like huge, hard bruises from the ones he reacted to weirdly. Poor guy. …and abrupt topic change back to mail! I’m part of a group on Facebook called Cross Stitchers Unite. It formed last month when another HUGE group for stitchers closed out of the blue due to a fallout with the admin (read: a whole bucket load of drama), so it’s still really new. One of the things the new group is trying to do is a birthday card exchange so I signed up as a guinea pig for the first month because why not?! I received two cards yesterday! Logan picked up the mail and asked why I was getting random cards then acted a bit panicked when I reminded him my birthday was coming up. He was surprised random people would be so kind as to send floss through the mail to strangers (even though floss isn’t expensive and I think it’s a wonderfully fun thing to do; I’ll sign up to be a sender another month). Logan famously forgot my birthday one year. Totally and completely forgot it. Then he forgot to get me anything for Christmas that year as well. The “one year” happened to be the first year we were married. It was a disaster. I’m not a superficial or materialistic, but a card would have been nice…even if he had scrawled something on a piece of paper. Last year, when Logan asked what I wanted, I told him I wanted to see a moose in the wild. Told you I was milking this. …but, I digress, as I do every time. …and now back to the sort of beginning of the post. After Logan pretended to freak out about my upcoming birthday thanks to the arrival of the floss, he decided he wanted to give me a present early. Presents are fun, so who am I to refuse?! Fellow knitters, you’ll understand just how excited I was when he tossed this my way. He didn’t wrap it. He didn’t *have* to. It’s a little zippered pouch of joy all into itself. He hit a massive homerun with this one. That’s the complete set of ChiaoGoo Twist Red Lace Interchangables in 4″! I looove ChiaoGoo needles and prefer working with circulars to straight needles on most projects. I only had a few of their needles, all in small sizes, and the two largest lengths of cables, so this is going to drastically alter my knitting habits. These sound so pretty when they click together. ❤ ❤ ❤ My hands are itching so, so badly wanting to do something with these! I already want to start swapping my scarf to these…or just be horrible and cast on something entirely new! …and finally, I actually sat at my computer a bit yesterday to catch up on my not-guilty-at-all pleasure show Rupaul’s Drag Race. It doesn’t make much sense considering the other shows I tend to enjoy (Star Trek, Sherlock, Twilight Zone, Archer, Galavant, Peaky Blinders, Ripper Street, Hell on Wheels, Firefly, that sort of stuff…), but I love it and am not afraid to deny it. Being at my computer means I finally got to knit a bit! Last time I’d just finished with the dragon, so I got through another 28 rows of double knit and am just about to start a 30 row dragon, this time a water one, for next knitting session. Logan has been working a swing shift and in an effort to see him, I’ve gone completely wonky. Turns out trying to stay awake when on those migraine meds put me right back into dopey land. I don’t recommend it. I had one of my famous 5 day migraines due to a storm system -before- he went on swing shift, so that accounts for the first missing week. It could be worse, I know, but I’m used to my medications being free or much, much cheaper. I guess morphea isn’t life threatening (though mine is painful due to its location and how thick it is, which is why the doctors are aggressively treating it), so they don’t much care to cover the costs more than telling the pharmacy to knock the price down from 400.99 to 289.70. Lucky me, guess that savings will cover my dermatology office visit. As a bit of a fun twist, some of our friends actually came up to visit us. One flew up from North Carolina, while two others drove up from Maryland and Connecticut. It was a miserably cold, rainy weekend that we had planned several months ago. We had hoped to go camping in the Adirondacks (before I sprained my ankle), so I guess I’m glad the weather was awful so I didn’t have to get left behind. Instead, we went to an aquarium and then saw Beauty and the Beast (finally!!!). We also drove down to Howe’s Caverns and did a lantern tour. The Caverns themselves weren’t the most impressive or interesting that I’ve been to (though the winding way in and out was a ton of fun and unique) but the lantern portion of it made it well worth the trip. I’m not sure if every group gets to walk back on their own, without the guide and armed only with their own little candles or if we were lucky because we were a small group and there were no other tours, but it was AWESOME to get to wander around alone in a dark cave. I’d highly recommend doing a lantern tour there if it’s always like that. Since our friends have left, I’ve spent most of my time outside working in the gardens. I feel a bit like a Disney princess out there lately. The birds are completely unafraid and after the initial shock of having a human out there with them, they’ll happily come to within just a few feet of me. One little chickadee in particular will even hop up to me if I’m sitting and chirp at me when I say hello. So far this spring in our yard (that I’ve noticed at our feeders), we’ve had black-capped chickadees, blue jays, tufted titmouse, red-bellied woodpeckers, ruby-throated hummingbirds, american robins, american goldfinch, white-breasted nuthatches, dark-eyed junco, chipping sparrows, northern cardinals, common grackles, mourning doves, downy woodpeckers, rose-breasted grosbeaks, and even a pileated woodpecker that scared my husband half to death because he didn’t realize just how large they were. If we go to the common fields we own with our hippy-dippy neighborhood, there are some nesting canada goose, a flock of turkeys, eastern bluebirds, red-winged blackbirds, and tree swallows from just a quick glance. I saw the guy that does the egg count there at the nest boxes over the weekend, so look forward to seeing the official counts. 🙂 I’ve never been much of a birder but it’s hard not to take an interest when there is so much variety in your own backyard. We’ve been cleaning several of our garden beds this spring — a few of which we haven’t touched since we moved here. They were infested with saplings and (unfortunately for Logan) poison ivy. I rebuilt a collapsed retaining wall over the weekend while Logan worked on weeding a bed of daffodils we planted last fall; it’s still hard for me to crawl around on the ground with my ankle stabilized. We planted the daffodils pretty far apart so we could execute our plan of planting strawberries between the bulbs this spring so we could have a useful bed all through the year. The strawberry plants, 75 of them, arrived over the weekend, so we’ve been planting like crazy. We’re not quite done yet since the weather keeps dumping rain on us, but we’re getting close! One of the beds, we’re completely redoing. I started prying out the years of junk that the previous owners had left in it — broken bricks, tiles, assorted rocks — in preparation for tilling. Poor Logan. He started helping and moved a brick and freaked out. He thought he found a nest of baby snakes. Nope. I thought he was going to have a heart-attack when I rushed in and scooped the little guys up (there were three of them) to move them. He’ll eat a berry I pick out in the forest but doesn’t trust me to know what I can and can’t pick up critter-wise… I know the salamanders (northern redbacks as far as I know) would have burrowed back into the soil, but since we were getting ready to till the area, I didn’t want them to get hurt and I know of an area in the side yard where a few hang out, so I hope they’ll be okay there. Better than chopped up by tiller blades? …and crafting. My favorite thing of all! I’ve been knitting a little on my RPG scarf — there aren’t many things to keep me tied to my computer and that’s really the only place I knit, so it has been slow going. I’ve started rewatching one of my favorite old animes, Bleach, while cross-stitching. It’s weird watching it in English but I wouldn’t be able to stitch if I had to read subtitles so I’m having to adjust to the dubbed voiced actors. I miss Renji’s Japanese voice. 😦 Bonus is that I can skip the filler arcs! They do a decent job integrating them and I enjoyed them enough when I was back in college waiting for each one to come out weekly, but it’s nice just getting to watch main arc this time through. I never actually finished the show because the fillers NEVER seemed to end. It’s finally time to do so. …which means cross-stitch progress! I’m past 1,000 stitches now and even more since this last photo. I’m still enjoying stitching, which is good. Probably bad though because I don’t want to do anything else except garden…and I have sooo much I need to do! Mom and I when I was probably about 3 or 4. I’m still just as sour and grumpy. …and because you can’t have a mom without a grandparents somewhere, here are my Granny Boo (Mom’s mother) and Grandmother (Dad’s mom) at my high school graduation forever ago. Last year, Mom asked for photographs of flowers and animals from our yard since we have so much diversity and I inherited (yay) both of the above’s green thumbs (Mom did not), so I spent all of last year taking pictures and then had a book made and sent it to her. 🙂 Thankfully, Mom loved it and immediately understood all of little references that I slipped in there that Logan didn’t recognize. A week’s progress sure doesn’t feel like much when it’s so tiny! That’s my first 500 stitch block and a bit of progress on the next set. I ran out of needles, which is almost absurd. There are so many colors and it’s hard to tell. 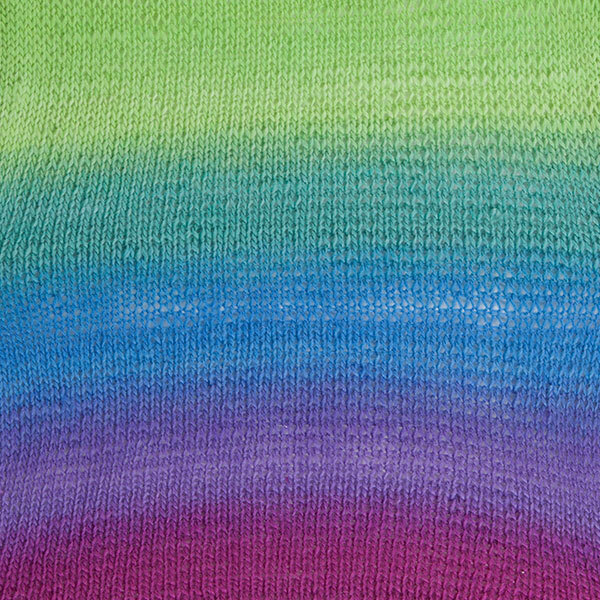 The one thing about it that’s driving me a bit bonkers, that you can see in photos but not really in person, is that some of the stitches are a bit looser than others, especially that first row and when a new color is added. Guess that’s what I get for having a zoom lens. Bah! Logan knows that’s all I’ve been doing because I’m covered in every kind of thread and fiber in my house right now. I’m kind of a hot mess. It’s totally worth it. I’ve also spent some time quilting my Spock quilt. I got about half way through with it and ran out of bobbin. For some reason, running out of bobbin is always an instant mojo killer. It’s now in time-out again until I feel like rewinding a handful of those little suckers. Any clue on what this block is called? I’ve also bitten the bullet and started stitching my HAED. I think I underestimated when I said it was going to take me a decade. There is so much confetti in this thing, it’s insane. I’m insane for trying it. I can’t even tell the difference in some of the 14 colors in the first 50 stitches. …but the last 18 stitches were all in the same color and that made me a very, very happy woman. I got tired of gridding, so only did it in 100 space increments. I figured that was more than enough to make sure I’m roughly on track without driving me totally insane. I’d much rather actually be stitching than just weaving shiny thread in and out. I’m probably going to regret that decision at some point and may go back in and grid out at 50 blocks since that’s what I’m stitching at, but we’ll see. I need to learn to stay on topic. I need to finish spray painting some rubber boots for Logan’s impromptu Tom Bombadil costume and finish packing, then I can call it a day. We’re leaving tomorrow for the migration to see his friends. We take a photo every year and in an effort to spice it up, we’ve started to theme them. Usually we’re pretty lame and just choose to wear a silly hat or something. This year, his friends chose Lord of the Rings. I think they were wanting to rewear their outfits from our wedding (roughly Renn themed if it was set on the Holodeck; it was pretty weird) — it’s our 5th anniversary Saturday — I’m not rewearing my wedding dress ON my anniversary for a photo….and Logan has a food baby now so can’t. Sooo we had to improvise a bit more. I ended up dying a shirt I made him a few years ago blue and we’re spraying some boots yellow. We bought a horribly cheap beard and I’ve felted and fluffed it and sprayed it with about a ton of hair spray until it looks passable. He’ll be a passing Tom Bombadil. Better than his favorite elves, at least. He didn’t want to shave to be an elf. The decision was made entirely last minute so I didn’t have time to pull off a proper Dwarf outfit I would have went there. I will not be a shorn beard and I will not do a disservice to their craftsmanship…so I decided to go a bit darker and pulled out a black robe and found a mask. Witch King of Angmar, ahoy! I was taking it seriously until Logan insisted I had to wear gray gloves and shoes to indicate the fact the wraiths wear plate or chain armor under their robes — he’s a big fanboy and takes Lord of the Rings entirely too seriously, as evidenced by the fact that he wouldn’t be an elf unless he shaved his beard. That’s when I went to the costume shop and got silver smoking gloves and plan to wear my 5″ gray stilettos with it. When photo time comes, I fully plan to show some leg and strike a pose. Angmar will have never been so fabulous. I’m 5’10. Logan is 6’ish. These bad boys don’t come out to play often. In other fun news, my lap stand arrived! The table in my sewing room is really chewed up. I’m sure the photo above makes that really obvious. I redo a lot of furniture but have chosen not to redo this table. I “helped” my dad refinish this table when I was little. I think I was probably more of a distraction than a help. The second reason I’m not really messing much with this table is that it’s old and pretty fragile…and even more sentimental. It’s one of the few true “family heirlooms” I have. If I understand correctly, my great-great-grandfather made it. My great-grandmother, Granny, his daughter, was born in 1899, so it has seen its fair share of my family. It’s much too short for me to use as an actual table (or maybe I’m just too tall; Granny and her siblings that I remember were all very short), but it makes a fantastic sewing table now that it’s on risers. So, off of that side rant. Yesterday ended up being quite “a day”. Meaning I was quite a grumpy, grumpy bear. Leave now if you’re squeamish! The little dog had an appointment at the vet for a tooth cleaning. She had one infected tooth that we feared may need to come out; it wasn’t causing her any obvious pain, but it was swollen and a bit of pus oozed out if you pushed it near the gums. Gross, I know. Our normal vet just came back from a hip replacement, so is booked solid for a few weeks. The vet said it wouldn’t really matter since the tooth didn’t seem to be hurting her or affecting her piggy appetite. I trust our vet. We’ve moved a lot and we’ve had a lot of vets. This one is probably my favorite. He’s very old school and no nonsense; more of the “animals are animals” breed of guy — dogs will be dogs and snarl at weird guys that are stabbing them with needles, cats will bite when you put your finger in their mouths. I wanted to wait until our vet had an opening. Logan wanted it done immediately because he was sure it was really hurting her. I regret it. So, so badly. I don’t regret many things in life, but this one, I regret. Logan was supposed to pick up my little dog — she’s MY dog now, he makes no decisions about her any longer — at 4:30. The vet isn’t that far away; he took her to the back up vet hospital we use when ours is out of town or closed. …two hours later, he’s still not home and not answering his phone. So I’m already panicking because it’s raining like mad and he’s not always the best driver in bad weather (the roads are crap here and almost impossible to see when it’s raining because of the reflections), much less when a dog is there to distract him…and he had to come a long way from work and there are some other bad drivers out there. …and there is Logan. On the doorstep. Crying. Of course I jump to a million conclusions and just about have a heart attack. Why did he ring the doorbell? Why is he crying? Where the hell is the dog? Thankfully the little dog decides to run around the corner and into the house. He rang the doorbell because the little dog was sick from anesthesia and pain meds. She’d had a massive, poopy blowout all over him and the car, so he was covered head-to-toe in dog crap (which was hilarious) and didn’t want to touch his keys or the doorknob to the house. Logan is crying because not only is he covered in poop, but he has to deliver some news he knows I’m going to be FURIOUS over…and he’s right. That’s a vial of teeth. The crazy butcher (certified dog dentist, mind you) ended up taking out SEVEN of her teeth. The infected one (far left) plus six more that, if you look at them, weren’t bad? He just removed 16% of her teeth?! I hope he can go old man crazy on the other vet. There has to be some sort of veterinary board or something this guy can be reported to…because it just seems cruel and unreasonable to me. The little dog kept waking up whining through the night, even though she’s on pain meds. She’s a resilient little thing and doesn’t complain much — usually only when we leave her. Even when Logan stepped on her, she only yelped when he actually stepped on her then whined when we had to leave her at the emergency vet. That was a complete accident; she was only 7 weeks old and we’d only had her for a week so he wasn’t used to having a little thing literally underfoot. He was out in the yard and she was following him around and he stepped backwards and didn’t realize she was there. No permanent damage, thank goodness, but she had to be hospitalized for three days — one of her lungs swelled shut and the other only had 20% function, so she had to stay in an oxygen chamber until her lungs recovered enough that she could get enough air in the normal atmosphere — two days at the emergency vet over the weekend and an additional day at the animal hospital when they opened on Monday. So not only did Logan have to deliver the news that my poor little dog can now only gum people to death, but then he had to deliver the blow that the vet charged over $700 to mutilate her. I about died…as in popped blood vessels in my brain from anger. …and then I almost killed Logan for insisting on taking her to a different vet then agreeing to let them do whatever they wanted to her. No wonder he was crying. Ugh. Seriously though, he was crying ’cause everything was covered in poop and he knew I’d be so upset/worried about the dog that I’d refuse to help clean the car in the pouring rain. He was right…and it was awful. The night Logan stepped on her, our neighborhood ghost skunk sprayed him when he took our big dog out for a walk. He’s always considered it her revenge. I consider the poop blowout her revenge for the teeth. Logan said he’s not sure which is worse. The other day in a Facebook group somebody asked why people don’t give credit to the designer/project when they share photos of what they’ve made. It’s only fair blah-blah-blah. Sure, designers definitely deserve recognition but we should also celebrate somebody’s talent that went into making what they just shared. I don’t see the need to get uptight about either one. Most people replied they were just excited they were done. Some were a bit more hard-line that they were innocent and *always* gave credit ’cause they were perfect and the angels sing down from heaven when they enter a room. I was the weird one. I usually am. I have good intentions but somewhere along the way, I disagree with a pattern or I don’t like the way something fits or flows….and then it’s no longer the pattern it started out as being. Sure, I could share the pattern but if somebody likes what I just shared a photo of then tries to get what I got based off of that photo, it’s not going to be the same. Does that happen with anybody else? Therefore, I always end up making a working copy for any pattern I’m working on, even if it’s a simple quilt or something I’ve designed, so I can mark down the changes I make as I go along. …especially if it’s something I’ve designed. Then I usually just have a sketch of the item and a blank notepad for lots and lots of notes so I can write it up later. Things I brew up end up being even less like what I had originally intended; projects take on a life of their own here. I’m horrible at following directions and am always making alterations to things I make. Usually the changes are intentional or I don’t like the designers methods (either I’m stubborn or dense, maybe both), sometimes they’re happy accidents…but I can’t think of a single thing I’ve ever made exactly like it was written. I’m really hoping the cross stitch pattern I’ve been preparing and belly-aching over will be the exception. I really am starting it with the best of intentions to keep it true to the pattern, totally and completely. There are 282,500 stitches so I’m going to be a coloring queen to keep from getting lost. I love this pattern. I don’t want to mess it up. Plus, there are 90 colors of floss. I’m not artistic enough to go off on a wild hair on this one. I’ll be lucky enough to keep all of these straight. I asked Logan to make me a working copy of the cross-stitch pattern yesterday so I can officially start once I finish gridding off my aida. He forgot to get the copies until after his administrative assistant left for the day. It never, ever occurred to me that he didn’t know how to work a copier. It took him over half an hour to figure out how to make the 45 pages I needed — nothing special, just 45 pages so I don’t destroy my original copy. It would have taken his admin aide two minutes, tops.